The ideal resistor was a useful approximation of many practical electrical devices. However, in addition to resistance, which always dissipates energy, an electric circuit may also exhibit capacitance and inductance, which act to store and release energy, in the same way that an expansion tank and flywheel, respectively, act in a mechanical system. These two distinct energy storage mechanisms are represented in electric circuits by two ideal circuit elements: the ideal capacitor and the ideal inductor, which approximate the behaviour of actual discrete capacitors and inductors. They also approximate the bulk properties of capacitance and inductance that are present in any physical system. In practice, any element of an electric circuit will exhibit some resistance, some inductance, and some capacitance, that is, some ability to dissipate and store energy. The energy of a capacitor is stored within the electric field between two conducting plates while the energy of an inductor is stored within the magnetic field of a conducting coil. Both elements can be charged (i.e., stored energy is increased) or discharged (i.e., stored energy is decreased). Ideal capacitors and inductors can store energy indefinitely; however, in practice, discrete capacitors and inductors exhibit “leakage,” which typically results in a gradual reduction in the stored energy over time. All the relationships for capacitors and inductors exhibit duality, which means that the capacitor relations are mirror images of the inductor relations. Examples of duality are apparent in Table 1. A capacitor is a device that can store energy due to a charge separation. In general, a capacitor (and thus, capacitance) is present when any two conducting surfaces are separated by a distance. A simple example is two parallel plates of shared cross-sectional area A separated by a distance d. The gap between the plates may be a vacuum or filled with some dielectric material, such as air, mica, or Teflon. The impact of the dielectric material on the capacitance is represented by the dielectric constant k.
Figure 1 depicts a typical configuration and the circuit symbol for a capacitor. Where εo = 8.85 × 10−12 F/m is the permittivity constant of a vacuum. The presence of a dielectric or vacuum between the conducting plates does not permit charge to pass directly from one plate to the other. However, if the applied voltage across a capacitor changes so will the accumulated charge. Thus, although no charge can literally pass from one plate of an ideal capacitor directly through to the other, a change in voltage will cause the accumulated charge to change, which is the equivalent effect of a current through the capacitor. 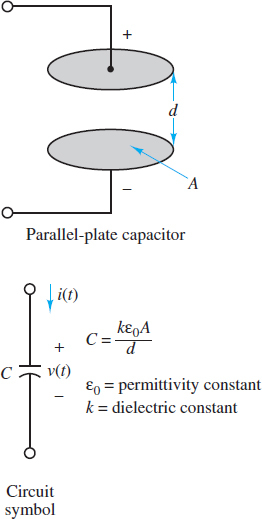 where the parameter C is the capacitance and is a measure of the ability of the device to accumulate charge. The unit of capacitance is coulomb per volt, or farad (F). The farad is an impractically large unit for many common electronic applications; units of microfarads (1 μF = 10−6 F) and picofarads (1 pF = 10−12 F) are more common in practice. One immediate implication of equation 4 is that the current through a capacitor in a DC circuit is zero. Why? Since the voltage across a capacitor in a DC circuit must, by definition, be constant, the time derivative of the voltage must be zero. Thus, equation 4 requires the current through the capacitor to also be zero. A capacitor in a DC circuit is equivalent to an open-circuit. The significance of the initial voltage vC (to) = Vo is simply that at time to some charge was stored in the capacitor, resulting in Vo, according to the relationship Q = CV. 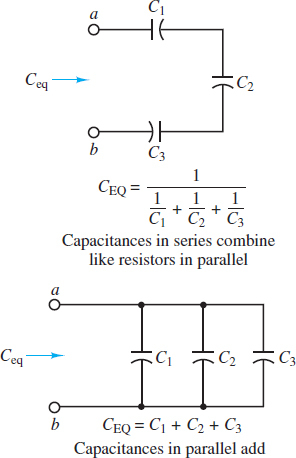 Just as resistors can be in series and parallel to yield an equivalent resistance, so capacitors can also be in series and parallel to yield an equivalent capacitance. The calculation rules are given below. Notice that the rule for the equivalent capacitance of two capacitors in series is the product divided by the sum, which is the same rule used for two resistors in parallel. Likewise, the equivalent capacitance of two capacitors in parallel is simply the sum of the two, which is the same rule used for two resistors in series. The more general rules are illustrated in Figure 2. When calculating equivalent capacitance, capacitors in series combine like resistors in parallel and capacitors in parallel combine like resistors in series. Actual capacitors are rarely constructed of two parallel plates separated by air because this configuration either yields very low values of capacitance or requires very large plate areas. To increase the capacitance (i.e., the ability to store energy), physical capacitors are often made of tightly rolled sheets of metal film, with a dielectric (e.g., paper or Mylar) sandwiched in between. Table 2 illustrates typical values, materials, maximum voltage ratings, and useful frequency ranges for various types of capacitors. The voltage rating is important because any insulator will break down if a sufficiently high voltage is applied across it. In practice, actual capacitors exhibit some leakage between the plates. Imperfect construction techniques invariably provide some capability for charge to pass from one plate to the other. This imperfection is often represented by an equivalent resistance in parallel with an ideal capacitor. An inductor is an element that can store energy in a magnetic field within and around a conducting coil. In general, an inductor (and thus, inductance) is present whenever a conducting wire is turned to form a loop. A simple example is a solenoid, which is a narrow and tightly wound coil of length l, cross-sectional area A, and N turns. Inductors are typically made by winding wire around a core, which can be an insulator or a ferromagnetic material, as shown in Figure 3. A current through the coil establishes a magnetic field through and around the core. In an ideal inductor, the resistance of the wire is zero. Where $\Phi $is the magnetic flux through the inductor core and iL is the current through the inductor coil. where μ is the permeability of the core. 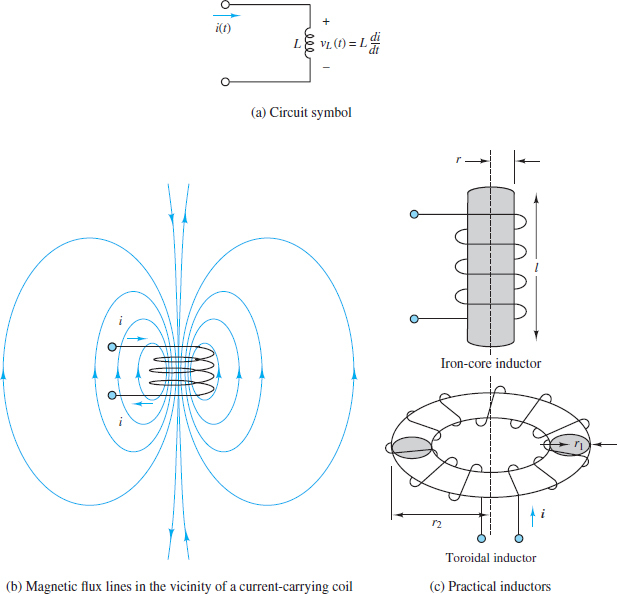 Another inductor found in many applications is the toroid, which is also depicted in Figure 3. Expressions for the inductance of toroids with rectangular and circular cross sections are readily found. Henrys are reasonable units for practical inductors although millihenrys (mH) are very common and microhenrys (μH) are occasionally found. One immediate implication of equation 11 is that the voltage across an inductor in a DC circuit is zero. Why? Since the current through an inductor in a DC circuit must, by definition, be constant, the time derivative of the current must be zero. Thus, equation 11 requires the voltage across an inductor to also be zero. An inductor in a DC circuit is equivalent to a short-circuit. Just as resistors can be in series and parallel to yield an equivalent resistance, so inductors can also be in series and parallel to yield an equivalent inductance. The calculation rules are given below. Notice that the equivalent inductance of two inductors in series is simply the sum of the two, which is the same rule used for two resistors in series. Likewise, the rule for the equivalent inductance of two inductors in parallel is the product divided by the sum, which is the same rule used for two resistors in parallel. The more general rules are illustrated in Figure 4. When calculating equivalent inductance, inductors in series combine like resistors in series and inductors in parallel combine like resistors in parallel. 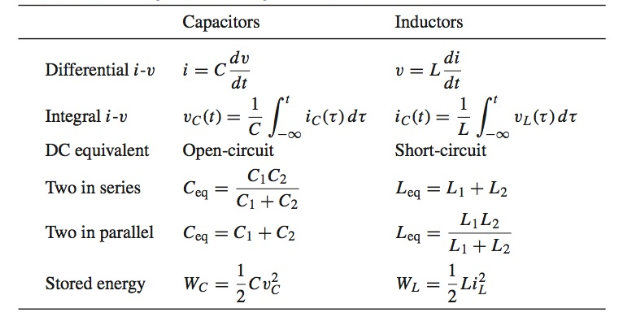 Notice that the inductor relation is obtained from the capacitor relation by replacing i with v and v with i. It is also necessary, of course, to replace the capacitance C with the inductance L. Another example of duality is found in the energy storage relations for capacitors and inductors. Duality is also at work in other relations not involving voltage and current explicitly. For example, consider the rules for calculating equivalent capacitance and equivalent inductance. Capacitors in series combine like inductors in parallel while capacitors in parallel combine like inductors in series. Note, once again, the duality with the expression for the energy stored in a capacitor, in equation 9.